The Clemson Tigers (4-0, 2-0) will be a part of history on Saturday, but whether is good or bad is up to them. 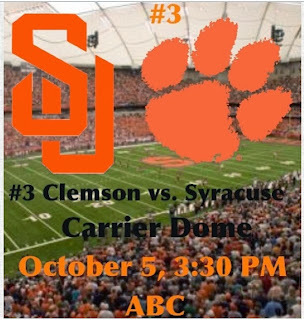 The Tigers travel to New York to face off in a Homecoming contest with Syracuse (2-2, 0-0) at the Carrier Dome in the Orange’s first ACC game. There has been a lot of smack talk from the Syracuse football team – in particular quarterback Terrel Hunt – about the Tigers not surviving the un-air-conditioned Carrier Dome. Syracuse has won its last six home games in the Dome. Can the Tigers survive their second road game of the season and continue their undefeated streak? WHEN THE TIGERS HAVE THE BALL: The Clemson offense finally started clicking last weekend against Wake Forest, but this weekend the Tigers will have a whole new set of challenges playing in the Carrier Dome in front of what will be a raucous crowd. Clemson quarterback Tajh Boyd will need to take what the defense gives him and find his check downs early on until the receivers can get used to finding the ball against the white backdrop. Eventually, the long-ball will open up for the Tigers. Running back Roderick McDowell injured his ankle last weekend, but is expected to play. Will he be at full strength? Who knows, but D.J. Howard and Zac Brooks are ready to step in at a moments notice. The Syracuse defense likes to bring pressure ,so the offensive line and tight ends will have to be on their “A” game to give Boyd time to hit the receivers. Syracuse defensive tackle Jay Bromley leads the team with 14 totals tackles, five tackles for loss, and two forced fumbles, so the center of Clemson’s offensive line will have to get off the ball quickly in order to keep Bromley from getting upfield. WHEN SYRACUSE HAS THE BALL: Since Hunt took over as the starting quarterback for the Orange, Syracuse has beaten Wagner and Tulane by an average of 35 points, posting back-to-back 50 point games for the first time since 1997. Senior Drew Allen began the season at quarterback, but was inaccurate and inconsistent. Since taking over, Hunt has completed 33-of-43 passes for 468 yards and seven touchdowns with no interceptions. He has also carried the ball 12 times for 91 yards and two touchdowns. Hunt is a dual-threat quarterback that if given time can beat you with his arm, but is also a running threat. H-back Ashton Broyld is Syracuse’s leading receiver with 19 receptions. Wide receiver Christopher Clark has 15 receptions for 202 yards and three touchdowns. In the running game, junior Jerome Smith is the Orange’s leading rusher with 51 carries for 217 yards and six touchdowns. The key for Syracuse will be getting into the red zone, where the Orange have scored on 21-of-22 possessions – 17 touchdowns and four field goals. The Tigers will need to limit the big play and not let the Syracuse receivers beat them deep. Clemson defensive ends Shaq Lawson and Vic Beasley will need to play disciplined football and make Hunt uncomfortable in the pocket if the Tigers are going to leave the Carrier Dome victorious. SPECIAL TEAMS: As I say every week, the Clemson special teams are second to none with Chandler Catanzaro and Bradley Pinion. For Syracuse, Riley Dixon handles the punting duties and has averaged 45.1 yards per punt over the last three games. Place kicker Ryan Norton is handling kicking duties for only his second game, but he has made three-of-four field goals with a long of 34 yards and has connected 14-of-15 extra points. Norton also handles kickoffs, but has zero touchbacks on the season. Could this be the week the Tigers finally break through and have a special teams touchdown? WHAT WILL HAPPEN: Much to the chagrin of Clemson fans, I fully expect this game to look very similar to the N.C. State game two weeks ago. It’s a new environment for Clemson with many external factors that could slow down the Clemson offense. But offensive coordinator Chad Morris will be there to make the necessary adjustments and get the offense on the right track. Don’t expect Syracuse to put up 50 points though…Clemson’s defense is a lot better than Wagner or Tulane. This one will be close at halftime, but the Tigers pull away in the second half.